Ambition: Graduate as valedictorian and attend Columbia University in NY majoring in Broadcast Journalism and Dance. Career Ambition: Become a Rockette while interning at Good Morning America working my way into the position of full time news anchor. Talent: Performing dance to So Much Better from Legally Blonde the Musical. Platform issue: Increasing the awareness and promoting teens to get involved in Extracurricular activities to improve their education and quality of life. 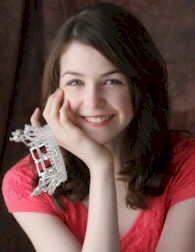 Accomplishments: Numerous dance awards, Ballet Wichita Company member, Second place in "Poetry Out Loud" competition, was in one of only five professional theatres versions nationwide of "High School Musical- Onstage"
Secret Dream: To become a well known trilingual news broadcaster and travel the world covering the news.